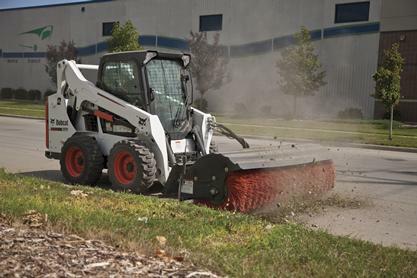 The angle broom is one of Bobcat’s most efficient products. It is the attachment that helps you clear your path by sweeping it flawlessly and with ease. It is simple to use and extremely efficient in clearing any path. The hydraulically-driven angle broom attachment helps in the removal of unwanted particles from the pavement or the substances that lay around your path. You can get rid of unwanted specks from your pavement surfaces with much ease using this handy angle broom. The broom bristles are precision-built by experts after exhaustive research to provide the best quality and long lasting user experience. Angle broom bristles deliver smooth cleaning because of their one of a kind wave design technology. The clearing ability gets enhanced every time you clean the debris. You can sweep snow, leaves, or dirt – whatever you want – with the Bobcat angle broom. Like all Bobcat products, it comes with a 100 percent customer satisfaction guarantee and it is cost effective. Operating the angle broom is extremely easy and simple, and it takes care of both large and small areas without any difficulty.